Fall in love with the Amish Yellow Pine Fan Back Swingbed custom made in the size you're looking for. A heavenly tool for relaxation, this spacious and inviting pine outdoor furniture is sure to become a family favorite. The perfect place to catch up on the news of the day with loved ones and a refreshing drink outside! Just as attractive as this beautiful fan design and the strength of pine wood is the price. Pretty as a picture, solid pine outdoor furniture provides you not only with sensational style but a great price to match. For more wooden outdoor furniture, browse the Amish Garden Furniture Collection, full of options for your outdoor decor. 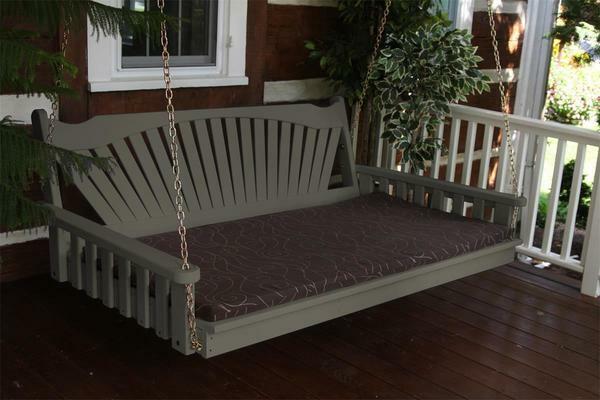 Unfinished, stained or painted can be accommodated with this custom made swing bed. We offer a variety of samples for you to consider. Our sensational collection of Sundown fabrics makes it easy and fun to design this outdoor swing. Select cushion colors and throw pillows that contribute to a cozy scene. Choose the custom length you're looking for with 4', 5', or 6' swing sizes available. Add a pine cup holder to one or both ends and consider a rope kit if you prefer that look to the rust resistant chains. 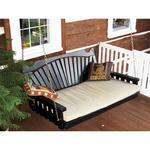 The Pine Fan Back Swing Bed is fine furniture for the outdoors. Creating a warm welcome and an inviting seat, this is Amish furniture your family is sure to treasure.